Taste test: These triangular tortilla chips tasted kind of like Cooler Ranch Doritos when I first bit in, but just a fraction of a second later, a much different taste started to kick in. 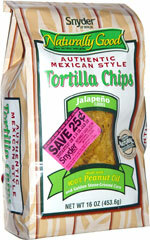 There's a thin layer of flavor powder on the chips that gives them some serious jalapeno heat. The heat starts gradually, but it really grows strong as you eat more more chips (and it's hard to stop eating more chips). Tortilla chips are meant for dipping, but if you're dipless, these chips have more than enough flavor to stand on their own. 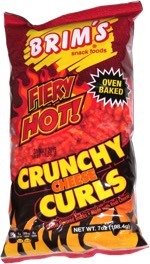 The chips were very crisp, with a great crunch, yet brittle enough to keep them munchable. The bag that these come was in kind of weird. It was difficult to open, and once you figure out how to open it, it's nearly impossible to open it evenly and cleanly. Smell test: Good tortilla chips smell, but not really any jalapeno.